Tri-Mer Corporation model W/W-100 high efficiency wet dust collector. 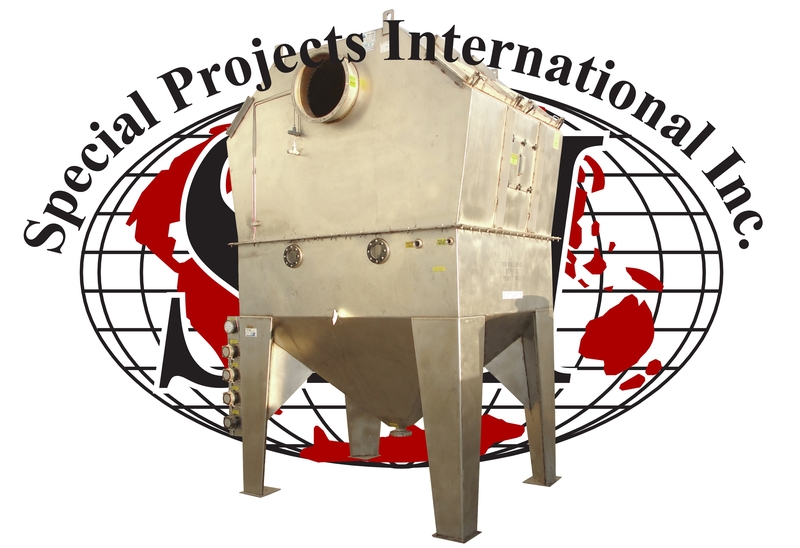 This Whirl/Wet dust collector is constructed of stainless steel. It is designed to remove particles that are 3 microns or larger. The dust collector is designed to handle an air stream of 8,400 to 10,500 cfm. The dust collector has 20″ diameter air inlets and outlets. The base has 4 sight glasses to monitor the water level. There is a 3″ flanged water drain in the bottom of the collector. There are also a 1.5″ and a 1.25″ npt fitting for water fill. The over-all dimensions of the dust collector are 100″ wide x 67″deep x 149″ tall (the unit can be disassembled into the 65″ tall top section and 85″ tall bottom section for shipping). This unit includes a 500 gallon stainless steel recirculation tank. The tank has on the top a 24″ manway, 2″ vent pipe, 1.5″ npt and 3″ flanged fitting. The bottom has a 2″ npt drain with 13″ of ground clearance. The water level is regulated by four pressure switches and a 15 psi pressure gauge. The over-all dimensions of the recirculation tank are 60″in diameter x 72″ tall. Blower and pump (not included) will need to be added specifically for your application. Last use was for spices. Serial number 40488.